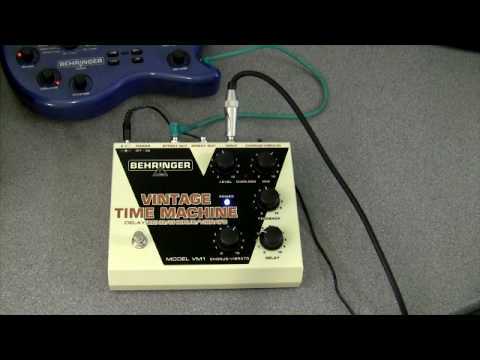 The VINTAGE TIME MACHINE VM1 effects pedal got its name with good reason. It features an awesome combination of classic effects that have stood the test of time. The VM1 boasts effects that include chorus, vibrato and delay. With up to 550 ms of organic analog echo, it sounds just like a classic vintage tape delay. Dial in the sounds of the 1970s with this fantastic piece of gear and let your sounds travel comfortably back in time, leaving the struggle with tape loops and worn-out mechanical gear behind you. A status LED for effect On/Off is included, plus there is a true hard-wire bypass for ultimate signal integrity. Travel back in time and get carried away by vintage analog effects with the VINTAGE TIME MACHINE VM1! Check one out today at your local BEHRINGER dealer.